Flushing out IS fighters in Libya's Sirte Jump to media player The Libyan forces are preparing for what they hope to be the last attack against Islamic State group in the city of Sirte. 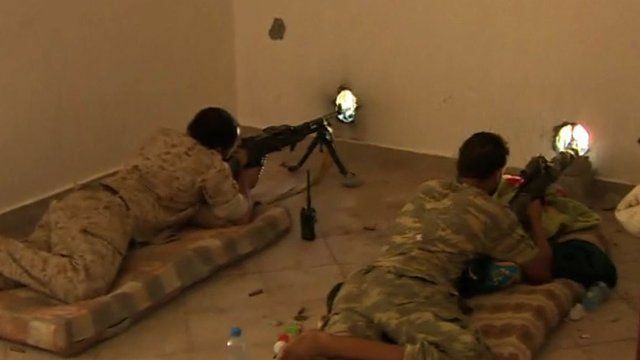 Fierce fighting in battle for Sirte Jump to media player Pro-government forces say they have made advances in against Islamic State fighters in Sirte. Bloody battles against IS in Libya Jump to media player Forces backed by Libya's unity government have made gains against fighters from so-called Islamic State in Gaddafi's hometown of Sirte. Libya's 'descent into chaos continues' Jump to media player At least 50 people have been killed by a truck bomb targeting a police training centre in the western Libyan city of Zliten. Dozens killed in Libya bomb blast Jump to media player At least 47 people have been killed and many more wounded in the worst bomb attack in Libya since the fall of Muammar Gaddafi. The Libyan forces are preparing for what they hope to be the last attack against so-called Islamic State (IS) group in the city of Sirte. IS fighters were surrounded in two districts, but the government forces postponed the operation to allow hundreds of civilians, thought to be held under IS control, a safe passage to leave. BBC Feras Kilani has this exclusive from the front line there; he was told that the attack should start Saturday morning.